Gotta figure out how to adjust the pic size, though. Latest version of Safari does not show my galleries. I don’t care if the code Imagekind generates is invalid. I’m restoring my galleries. The hell with validating this site. I give up. You nerds go fix it, I’m through. Enter your name, or a word, your birthday, your address, a mathematical anything! You will get a unicorn personalized just for that bit of information! How awesome is that? The other day I was installing the latest version of WordPress and twiddling around, seeing if there was another option to the various Identicons that are offered. There is the original Identicon (which looks like quilt squares), Wavatar (goofy geometric faces), Monster ID (which I was using for this blog, various silly monsters with arms and legs) and now in the recent version of WP, Retro, which look like old 80s video game icons. After a few fixes, I was able to validate the new version of my jewelry site. It’s not hard to do as Artisteer creates valid markup, but what gets dicey is when you add various elements like sidebar widgets. So I checked this blog over at the Validator, and I got about 87 errors. Every single error came from a sidebar widget. I had to recall the Recall Walker Countdown Widget…it gave too many errors that I couldn’t figure out how to fix. But I did figure out how to fix the Imagekind Art Galleries which were giving the majority of the problems, and now? CLEAN CODE that validates! I love it when I can fix nerd stuff that nerds should’ve fixed in the first place. You may find these useful. Remember, Do NOT use spaces when typing emoticons! I added a new widget which allows me to select from a set of pictures to add to posts. I’m going to be using the icon I created of myself yesterday (still haven’t decided what to do about my gravatar comment icons). I split it up into 9 sections, so each post will show one of those parts of me. Obviously if you guys want to use icons for yourselves, you’re welcome to let me know what you want and I’ll be happy to make them for you, but if you use mine it’ll look like I’m posting, so…um, not a good idea. Since I got the latest Artisteer 3.0 I’ve been looking at all the new features and decided to redo this design. Artisteer 3.0 just came out the other day. This version allows for fluid width, and editability so you can create actual web pages directly in the program, instead of saving out a template and editing in BBEdit or another text editing program. I created a new look for the blog. I wanted to have a more updated picture of Jasper without bendy ears. One of the really old themes even had a picture of Plato, so I wanted to update to the current lineup of animals. Also, the ones created last July were sort of created hastily anyway, so I wanted to have something else. This is the first time I’ve had some time to work on it. This design fits better with my Eyebalm Fine Art site too. 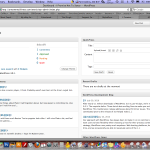 It’s sort of a pain playing around with widgets (the sections in the sidebars in WordPress for the uninitiated). Each time I install a new theme, my widgets disappear. I don’t know why this happens. I would like to have more of a variety of art styles of the pet pictures in the future. This is the Gilded Pets…I could do a pop art version, or some other genres too. I’ll play around some more. The theme switcher ability will return at some point. I hate technology so much sometimes! I couldn’t believe my eyes. My dashboards were royally efdup. Click the thumbnails below to see what I mean. I’m glad I took a picture of them to prove I wasn’t imagining things. I knew what had happened. I had been hacked. So I immediately contacted my hosting company…er…let me rephrase that. After I got a sudden wave of hotness all over my body as it went into panic mode, after my stomach unravelled some butterflies, after I put the puppy in his crate and paced around wondering what on earth to do, after I felt like vomiting, I contacted my hosting company. I looked into it some more and some of my sites had also been effected. Main headers, mostly. 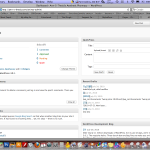 And although my wordpress dashboards said I had a zero count for posts and pages, they were all still there. I also did a search for wordpress hacked, and came to a wordpress.org page. And you know what? It looked like someone had hacked that page too! OK, wait a minute, I thought…how can this be happening? How can both my sites AND WordPress itself be hacked? So I thought I better get a 2nd opinion, meaning my other laptop. So I went upstairs and checked it out. And everything looked normal. So I contacted my hosting company again, feeling a little embarrassed having jumped the gun (but what would you do, right?) and told them it might be my computer. In fact, I don’t even know if it was my computer. I checked it on Firefox (Safari is my default) and everything looked normal. I had to restart Safari by force quitting, and once I restarted, everything looked normal. I’m pretty stumped. A real “what was that that just happened?! ?” moment. There’s too many questions I can’t even begin to ask.